The toughest part of implementing a solution is knowing how to get its best output. Today, it's easy to choose a software but what if you can't ensure its proper use? You would not find anyone struggling to select a solution. But many of the organizations are not even aware of how they are falling behind or remaining deprived months after months. Proper implementation practices let you smartly deal with your customers and ensure the best use of CRM software. There was a time when people used to use CRM solutions basically for data collection and management. But now, most of the organizations are using it for lead nurturing, email marketing and sales projection. Customized CRM software is a necessity these days for even small to medium businesses. 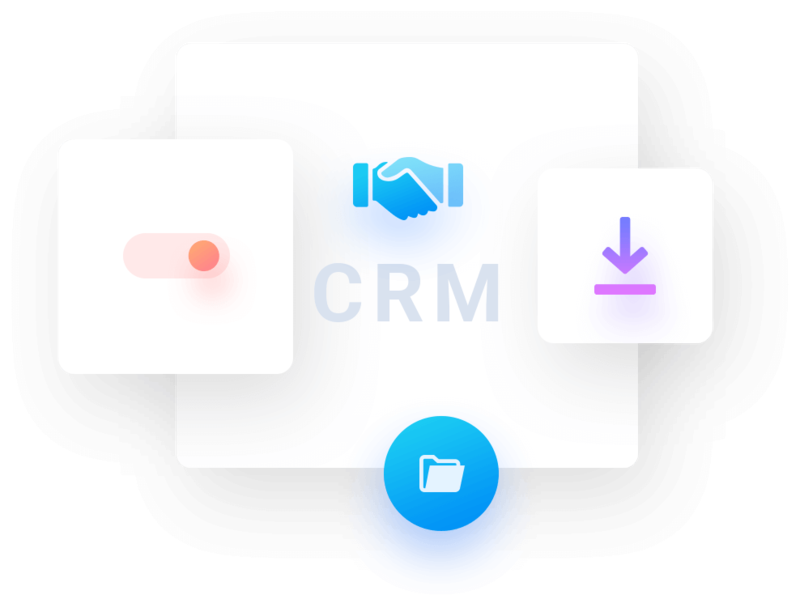 In this post, we are going to discuss CRM implementation best practices that will help you perfectly utilize your CRM software. Moreover, you would get the answer on how to choose a CRM, if you haven't chosen one yet. Nowadays, 91% of organizations with a team of 10 employees are also using CRM software. Over 65% of organizations start using a CRM within 5 years of their journey. On the other hand, around 40% of businesses not even familiar with CRM software. This is the situation of today's CRM industry. So, what's your point of view regarding others? Keep these points on your mind while choosing your customer relationship management software. You may already know what to look for in a CRM solution before implementing it for your business. Today, even non-traditional companies use CRM to ensure long-term growth. When you are going to implement a CRM software, it's clear that you want to improve your customer management system. But first, you need to define your problem and identify your goal. Talk to your front desk people, marketing and promotional team about how they are dealing with current customers and what do they think for the upcoming days. Since they will work on it and manage the day to day activities, it's always better to audit your needs and identify your goal talking to them. Set a primary goal about where to focus- making sales pipeline faster or handling unorganized data to secure running growth and design a better plan for the future or just automating your CRM objectives. Find out what CRM features your organization might need regarding your current growth? These are the facts that would help you choose a solution according to your needs. When you have a detailed report about your on-going CRM process and clear guideline on what to do next, now is the time to prepare a well-defined strategy. How will you ensure data-entry in a proper way? How to get reports & how to use this data to ensure proper improvement? Another thing is to train your people for being ready to perfectly utilize the solution, as we mentioned earlier. According to various reports, 40% of the employees even don't know what is a CRM solution or how to use it. So you should take it seriously and prepare them before going live. Now let's have a look at what you should do in this step. Organize and prepare all of your recent data to migrate. Configure your existing data management system before installing the new solution. 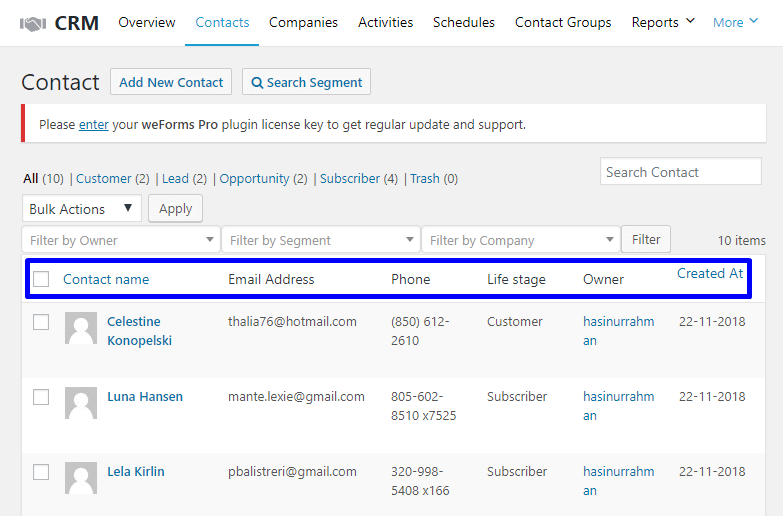 And finally, import your data to the new CRM software to start the actual processing. The better you can organize your data and design your plan, the better is the result you can expect to get. When you are using CRM software, try to maintain flexibility. People who are in your list, surely they are experiencing some other useful CRM solutions or went through. Any wrong approach could cause a heavy loss. So, be careful while collecting their data and using them for your business. Another significant thing is to automate repetitive/recurring tasks. There are lots of repetitive tasks within a project. If you need to manage all of them separately, that is just a waste of your precious time. Try to select a solution that offers task automating opportunity with other functionalities. Being and managing a data-driven system is a must these days. The richer your data collection, the better the result is. So, consider a well-designed reporting from the first day of your CRM utilization. CRM software is usually designed to easily store and manage customer data. But modern and smart CRM solutions offer advanced level reporting and analytical support to make data-driven decisions. You would just fall behind if you can't collect timely reports from various aspects. Don't rely only on the features given by the developer organization. Find out what do you need and be sure about whether your adopted solution support customization opportunity or not? If you satisfy by only getting what you need today, you would suffer just after a few months. In this age of information, the business landscape is changing quicker than ever. When you have a strong customer group, you should have a solution that allows proper customization with third-party solutions as well as its own scalability. So, try to select a solution that has enough customization opportunity. CMS platform like WordPress is a great choice in this regard. 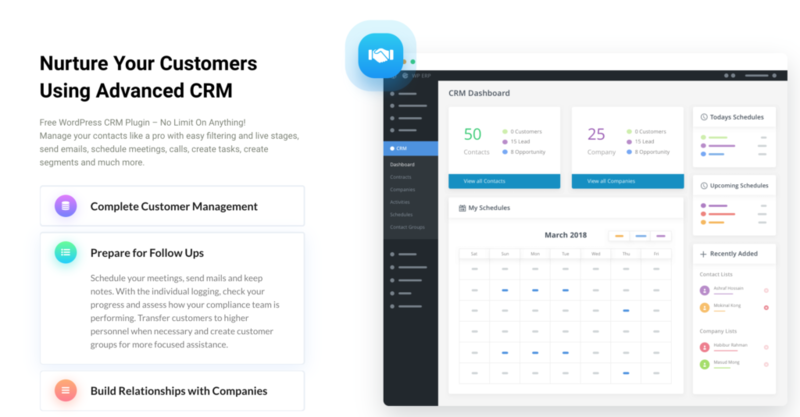 When you are ready to utilize and implement a CRM software, get everyone on board including the customers, companies, managers, and others who are in your list. Customer relationship management is a two-way relationship management system that helps both of you and your customers to interact with each other. Not only you, but your users could also get benefited through a CRM solution in many ways. Let them know and understand their own benefits and utilize the solution properly. When your customers are well aware of using the solution, you can easily handle them and make a long term plan for your project. Smart CRM solutions offer data importing from various platforms using third-party apps or extensions. 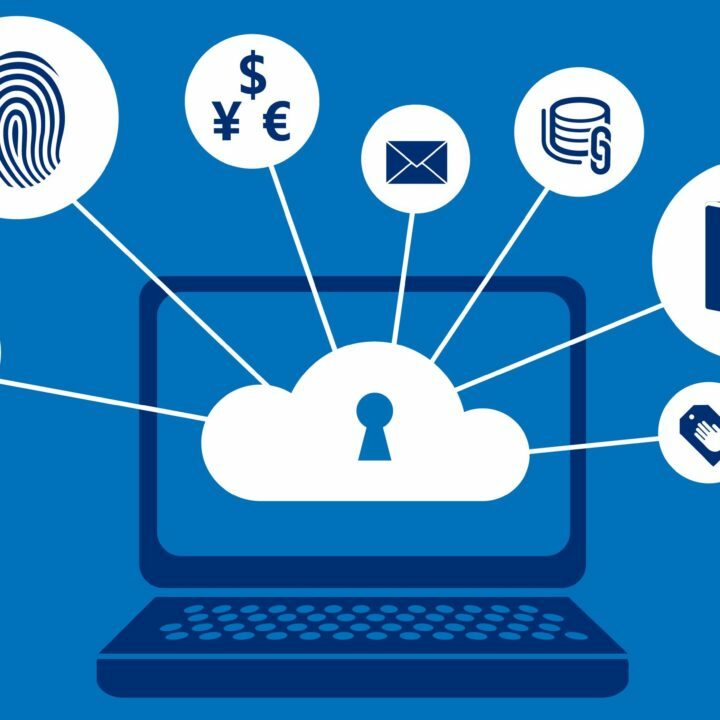 Many organizations treat CRM software as only the channel of collecting customer information and storing them for further use. It's partial thinking and not so wise in practical terms. The main focus should be on building a long-term relationship with them and provide real-time support anytime they need or want. And in this regards marketing, planning or other uses are your secondary purpose. And be careful about the misuse of the personal information of the customers. One single mistake can hamper your brand name in a lot of ways. So, give what they need. If you can add some value, they will return the favor with good word of mouth & recommendations. That's the actual achievement of your business in real meaning. We already mentioned that customer relationship management is a two-way relationship-communication process. When you engage with your customers, you should let them know about the solution you are using. If they are aware of your solution, they will start to use it as their own and you will get your desired data according to your plan. If you fail to get the result you want, that means there are some issues. Your selected solution may not be able to provide the proper support or your customers won't be able to utilize it. If there is an issue with the software, talk to its developer company to fix the bugs or customize it if you need something different. On the other hand, if the problem found from your customers' side, then train them to use the solution perfectly and make them understand how they could get benefited from using it. Since customer engagement is the main purpose, you should care about what and how they would love to interact. 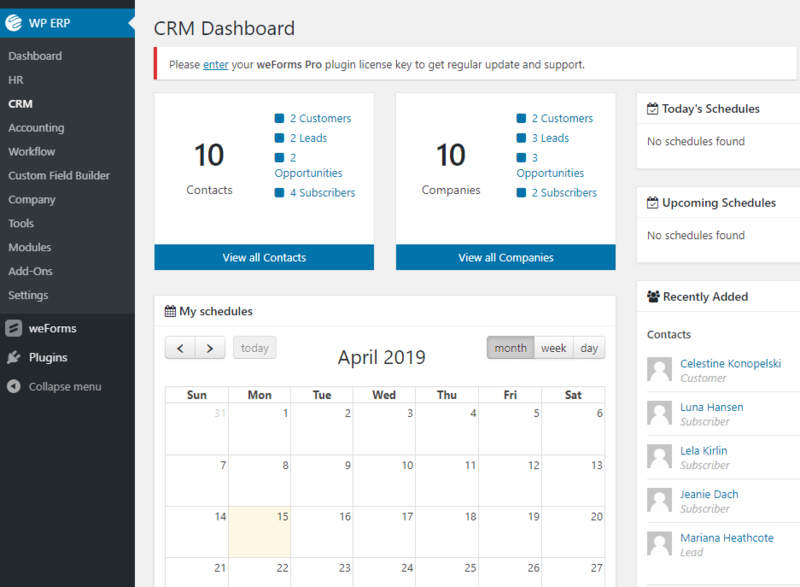 If you are a WordPress user, check out this detailed comparison on CRM plugins. With the basic features of a CRM solution, you will get a guide on how to choose the best one regarding your needs. There are lots of solutions out there, you should find out the most suitable one for your project. A comparison post can help you the best in this regard. After picking up a solution, you should keep monitoring its overall performance. From data collection, importing, managing, tracking, and getting reports; you should monitor all the fields and its operations. Implementing software in a proper way is more important than its selection. CRM implementation best practices let you prepare your strategy, choose a perfect solution and finally utilize it just as you want. To collect and manage customer information, you need to design a complete data plan. Consider these things to make your job easily done. And, you can get all your necessary solution with WP ERP CRM and some more that you would need in upcoming days. 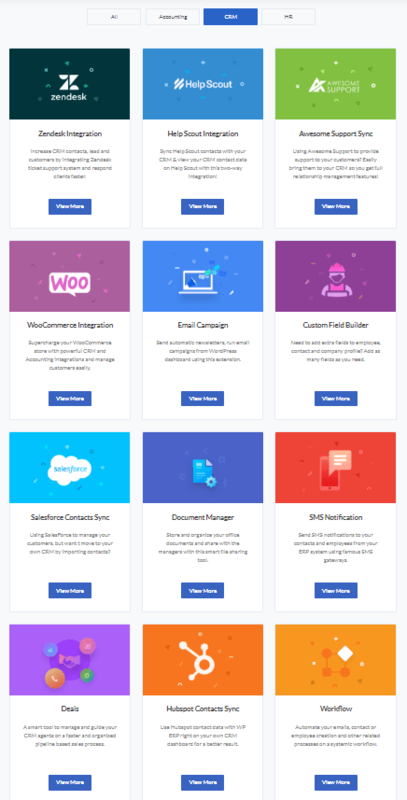 WP ERP CRM offers a complete customization opportunity with around 15 useful extensions. Do you need more!… If you are using any CRM software or want to share your thought on this topic, let us know in the comment section below. Give A Try To WP ERP Demo Now!